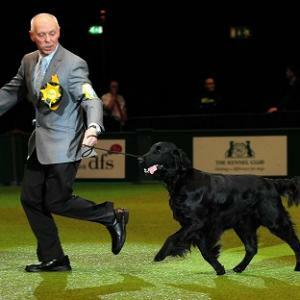 A flat coated retriever has claimed the coveted Best in Show prize in this year’s event at Crufts. Jet, who hails from Edinburgh, saw off a staggering 21,000 other dogs to claim the title. He first claimed first place in the Gundog category. However, Crufts wasn’t just about dogs that embodied the most desirable characteristics of their breed. Some of the UK’s most loyal pooches were also celebrated prior to the Best in Show award competition. Golden Retriever/poodle cross Kaiser got his paws on a special Friends For Life award for assisting his owner Joanne Day. Joanne suffers from Dystonia, a neurological condition which makes muscles spasm and contorts the body out of shape. Kaiser helps Joanne with her tasks every day, and has inspired her with the confidence to leave her home. Other faithful hounds that were nominated for the prize were cocker spaniel Jake, who assisted at the scene of the London 7/7 bombings, and Labrador Echo that worked with his handler in the Haiti earthquake search and rescue mission. In other dog show related news, Byker Grove heartthrobs Ant and Dec crashed this year’s Crufts as part of game show Push The Button, and were inadvertently awarded the Best In Breed prize for the Over-Exposed Geordie Mongrel category.